Central is a full time station located in the heart of Sheffield which has a large cross section of premises and risks including densely populated residential areas, universities, office, retail and industrial properties. TCentral also covers the surrounding areas of Broomhill, Broomhall, Heeley, Sharrow and Crookes. 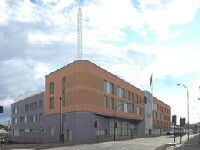 The Control Room and Command Headquarters are also located on this site.